chance of winning a family eco-holiday, head to the Vileda UK Facebook page. I would love to win as it would help with my big spring clean! just about to do a big spring clean, so this would be great!!! I would love to win because I bought a steam mop, but would much prefer to go back to a vileda mop, I dont think the steam mop is as good a clean as a proper mop! I'd love to win because i'm bored of replacing every kitchen cloth once a week because it's rubbish and doesn't last. I'm always cleaning and I love Vileda as they are quality products. This would be perfect for a massive spring clean!! Would love to win as my house needs a spring clean, and these look perfect for the job. We need a new mop. Cos I need a bit of a clean up in my cave! My whole house needs a good clean, so winning all this would motivate me to do it. I'd love to win because it is spring cleaning time and I love freebies to help curb the cost involved. I would like to win because I am disabled and on alow income, so winning would save me some money on cleaning products and help my carer with some quality cleaning products for a nice change. Dog, Cat, Back Garden, Rain = Mess!! Need help cleaning! Good products, and useful for a Spring clean. I commented on blog :- Save the Blow Dry. I would love to win because it would save me spending loads of money on cleaning products, I can put it towards something that will last longer! I could do with some help with cleaning so would really love to win. I would love to win so i can give my house a good spring clean. Would love to win as I need to Spring Clean! I would love to win as I am in the process of decorating my home and this set would help too keep it clean once I have finished. I'd love to win because my current cleaning cupboard is full of tired, dirty, old things that really need changing. I've been playing the floormiles game every day and am a bit addicted!!! Anything that saves me money is a good thing. I'm an OCD Cleaner.. so go through cleaning products like there's no Tomorrow ! I am getting ready for a big spring clean so this would be a big help! Vileda priducts are well designed and I enjoy using them. I have just moved and the place is a mess! we have run out of cleaning stuff! I hate buying cleaning products so id love to win! 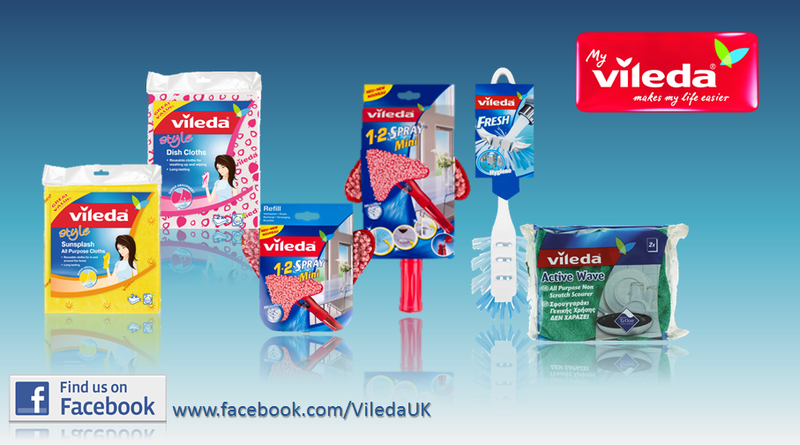 I need to do a good Spring clean, so I would love to win as Vileda are the best products for the job. id love to win so i can do a good spring clean! I'd love to win because, unfortunately, I have a lot of cleaning to do! When it comes to housework, I need all the help I can get ! I'd love to won to encourage me to do the spring cleaning!! really need to start my spring cleaning and this will give me the boost that I need!!!!! Extra cleaning products are always useful! You can never have enough cleaning products! Because my housemate has mild OCD and it will keep her quiet! I could do with some new cleaning products! Have just finished a year long renovation of my home - now i need to clean it! Have just had time throwing away all old cleaning...Stuff....need to get some super new!!!!! I never got round to that spring clean! I'd love to win as my kitchen needs a really good clean. I'm clearing my WHOLE house so would be so handy! !